In a previous column,1 we focused on the historical constitutional development of due process rights in attorney discipline cases, and briefly highlighted the relatively few New York cases addressing procedural due process rights accorded to New York lawyers facing disciplinary charges. 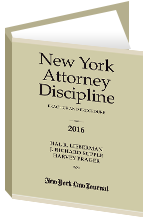 This article attempts to drill down by discussing several particular aspects of New York’s disciplinary system—interim suspensions, collateral estoppel, standard of proof, and rules of evidence—to assess whether those components of the system conform to constitutional due process standards. A future article will address other facets of the system, including: self-incrimination, the right to be heard on appeal, reasoned decisions, discovery, and the fairness implications of a decentralized disciplinary structure. Reference will also be made, where appropriate, to the American Bar Association’s “Model Rules for Lawyer Disciplinary Enforcement” (Model Enforcement Rules2), the guideposts for national standards. Harking back to 1983 and the infamous Roy Cohn case,9 the doctrine of collateral estoppel has since been widely used by grievance committees in New York to establish disciplinary liability.10 A principal basis is judicial economy; collateral estoppel in the disciplinary context precludes the necessity for relitigation of a prior civil adjudication implicating a lawyer in professional misconduct. To invoke the doctrine, however, two requirements must be met: (1) proof of identity of issue; and, (2) proof that the lawyer had a full and fair opportunity to litigate.11 As to identity of issue, the elements of proof required to show that a lawyer violated an ethical rule must be the same (or functionally identical) elements of proof that established civil liability in the earlier case. These are classic “due process” concerns. Notably, the New York Court of Appeals has yet to address the applicability of collateral estoppel in the context of attorney discipline. But until that happens, and greater guidance is provided, grievance committees should not seek to preclude relitigation of a lawyer’s professional conduct based on superficial or rote acceptance that a prior adjudication critical of a lawyer’s behavior warrants an automatic determination of collateral estoppel.13 Rather, collateral estoppel should be applied only where the issue decided in the earlier litigation is plainly the same as the one to be addressed in order to find professional conduct, and only where the prior adjudication was singularly fair to the attorney now subject to potential discipline. In New York, unlike the majority of state and federal jurisdictions, the standard of proof required to establish professional misconduct is “preponderance of the evidence,” the civil standard.14 This, despite the U.S. Supreme Court’s holding in Matter of Ruffalo15 that disciplinary cases are “quasi-criminal” in nature. What are we to conclude from New York’s insistence on a lower standard of proof in discipline cases? Foremost is the presumptive notion that New York courts are entitled to adopt a different (and lower) standard of proof without violating federal constitutional rights, although neither Matter of Capoccia nor Matter of Friedman, two prominent cases in which this issue was raised, was reviewed by the U.S. Supreme Court.16 But the fact that a majority of jurisdictions have adopted the Model Enforcement Rules standard of proof “by clear and convincing evidence” is significant,17 and should be considered in any future analysis of New York’s disciplinary system by a study commission or other “blue ribbon” panel looking at potential reforms. (1) General rule. All evidence which the referee deems relevant, competent and not privileged shall be admissible in accordance with the principles set out in section 605.1 of this Part. (k) Reception and ruling on evidence. When objections to the admission or exclusion of evidence are made, the grounds relied upon shall be stated. Formal exceptions are unnecessary. The referee shall rule on the admissibility of all evidence. While the First Department’s rule generally accords with the flexible standards provided in the Administrative Procedure Act,18 it does not clearly address the range of evidentiary issues that can often arise in civil litigation, let alone admissibility of evidence in “quasi-criminal” disciplinary cases. This was perhaps best illustrated in Matter of Zalk,19 where the Court of Appeals reversed the First Department’s determination, inter alia, that the Dead Man’s Statute could be invoked by disciplinary staff counsel in an attorney disciplinary proceeding. Parenthetically, none of the other departments even has a rule regarding admissibility of evidence in disciplinary cases. As noted in our initial column, from the standpoint of federal constitutional guidance the states have been left with fundamental but only very general notions of how the due process rights of lawyers facing discipline should be protected. In essence, due process as applied is left to a case-by-case, state-by-state determination, with broad discretion. When one examines particular aspects of the attorney regulatory system in New York in connection with due process as applied, as we have attempted to do here with a few examples, a troubling theme emerges. In addition to non-uniformity and divergence from national standards, in some Departments there are simply no standards at all, leading to ad hoc procedures and outcomes that may or may not comport with due process. We will discuss other examples of this in the final article.